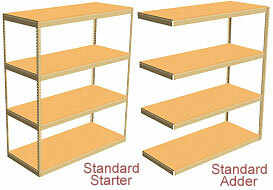 Choose starters or adders - shelf capacities up to 1,400 lbs. Center supports are used with double rivet beams in heavy duty shelves. They give added stability to beams and increase the shelf capacity. Capacities are based on evenly distributed loads and take shelf structure materials into consideration, not shelf deck materials.) For assistance with high capacity applications, call us or submit a shelving application inquiry. Starter units have 4 angle posts, and can stand on their own. Adder units use 2 Tee Posts which are shared with an adjacent unit. Adder units must be attached to an adjacent unit. Using starters and adders can be more cost effective than using all starter units, but may limit flexibility for later reconfiguration. All of the units in this section have a center support added to each shelf level, which increases the shelf capacity. 96" wide units have two center supports per shelf. All other sizes have one support per shelf.